Can you jump start a lawnmower Using your Car Battery? We recently received a question from a reader? Can you jump start a lawnmower using your car battery? The answer is yes with conditions! First of all your lawnmower must have a battery and have an electric start capability. This rules out many lawnmower. Operators need to check the manual to be sure that this can be done. There should be instructions on how to proceed. If you do not have a manual, find one online for your lawnmower. Your cars battery is 12 volts which means you can only connect to another battery that is 12 volts. Make sure your lawnmower battery is also 22 volts. Once you have confirmed that both batteries are 12 volts you can connect them using proper jumper cables. Always connect positive terminals together and negative terminals together. Never connect positive to negative. Now that they are connected your lawnmower battery will be charging. Try starting the engine. You should only crank the engine 5 or 10 seconds at a time. 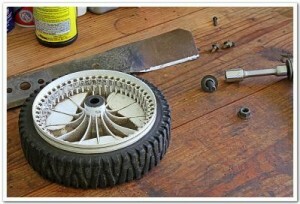 More than that can damage the starter motor or the battery. If the engine will not start you may have more serious problems. Start by disconnecting the jumper cables. Then check that there is gasoline in the fuel tank. Add if necessary. Next check the spark plug. Remove it from the engine using appropriate tools. If it is corroded either clean it up or replace it. Reset the gap to the manufacturers specifications. Try restarting the engine using jumper cables if necessary. If it still will not start you may have more serious problems and should consult a mechanic. 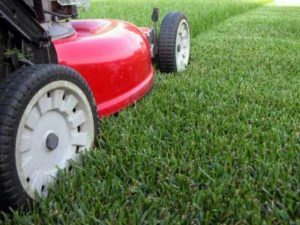 Injuries to Children from Lawn Mowers are on the rise, however if you follow a few simple safety precautions these injuries are easily preventable. Adults are responsible for the safety of themselves as well as their children. The majority of accidents involve an adult. Protect our children as well. Keep them well away from operating lawn mowers to keep them safe. In 2010, about 253,000 people were treated for lawn-mower-related injuries; nearly 17,000 of those involved children under age 19, according to the U.S. Consumer Product Safety Commission. Lawn mower injuries are up 3% in 2010 compared to 2009. You can easily prevent lawn mower injuries to children by keeping children inside the house. Or under direct supervision of another adult whenever a lawn mower is being used. Keep anyone including adults away from running lawnmowers other than the operator. Create a danger zone of 20 feet around the mower. Shut the machine down if anyone gets within that distance. Many lawn mower injuries require a team of doctors from various specialties to treat and repair severely damaged limbs. Many patients must go through painful reconstructive operations for months or years. They recover some semblance of their former abilities and even then it generally is not 100% recovery. Children should be at least 12 years old before they operate any lawn mower and at least 16 before they are allowed to operate a riding mower. Instruct everyone on how to use a lawn mower. Operators of mowers should wear safety shoes, not sandals. Keep young children at a safe distance from the area being mowed. Adults should pick up stones, toys, and other debris from the lawn to prevent them from becoming flying objects that could cause injury. Mowers should be used that have a control that stops the machine from moving forward if the handle is released. Never pull backward or mow in reverse unless absolutely necessary, and carefully look for others when going backward is necessary. Use Eye and hearing protection while mowing. Lawn mowers can cause serious eye injuries. Wear polycarbonate protective eye wear. 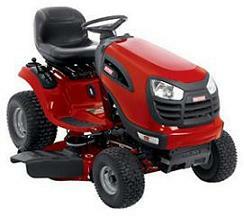 It is really up to the operator to make sure that while you are operating a lawn mower you do so in a safe manner. A significant number of “devastating injuries” occur to children and adults that can be life-changing events. Loss of a limb – hands and feet can change your life forever. Broken and dislocated bones, deep cuts, missing fingers and toes, limb amputations, burns, and eye injuries” caused by lawn mowers are just a few of the injuries that are possible. Lawn mowers have many safety devices on them today, however many people still try to circumvent them. This is only asking for trouble and potential injury. Use common sense when running a lawn mower and if it feels unsafe, then it probably is! For more information on Lawn Mower safety, click here.